L1 (S26), also known as Null DYS439, was discovered first by Leo Little and Family Tree DNA and S26 was discovered independently soon after by James F Wilson. Y-DNA haplogroup R is mainly represented in two lineages. Lineage R1a is thought to have originated in the Eurasian Steppes north of the Black and Caspian Seas. It is associated with the Kurgan culture, known for the domestication of the horse (approximately 3000 B.C.E.). This lineage is currently found in central and western Asia, India, and in Slavic populations of Eastern Europe. A well-known individual of the R1a lineage is Somerled founder of Clan Donald. Lineage R1b originated prior to the end of the last ice age where it was concentrated in refugia in southern Europe and Iberia and is the most common in European populations. It is especially common in the west of Ireland where it approaches 100% of the population. This haplogroup contains the Atlantic modal STR haplotype. Adams et al, The Case of the Unreliable SNP: Recurrent Back-mutation of Y-chromosomal Marker P25 Through Gene Conversion. (abstract) Forensic Science International 159:14-20, 2006. Cinnioglu et al, Excavating Y-chromosome Haplotype Strata in Anatolia. (pdf) Human Genetics, 114:127-148, 2004. Kayser et al. Reduced Y-Chromosome, but Not Mitochrondrial DNA, Diversity in Human Populations from West New Guinea. American Journal of Human Genetics, 72:281-302, 2003. McEvoy et al, Y-chromosomes and the Extent of Patrilineal Ancestry in Irish Surnames (abstract) Human Genetics 2006 Jan 12;:1-8 (Epub ahead of print). Semino et al, The Genetic Legacy of Paleolithic Homo Sapiens Sapiens in Extant Europeans. (pdf) Science, V290:1155-1159, 2000. Sengupta et al, Polarity and Temporality of High Resolution Y-chromosome Distributions in India Identify Both Indigenous and Exogenous Expansions and Reveal Minor Genetic Influence of Central Asian Pastoralists. (available by subscription) American Journal of Human Genetics, 78:202-221, 2006. Wells et al, The Eurasian Heartland: A Continental Perspective on Y-chromosome Diversity. PNAS, Vol. 98; 18:10244-10249, 2001. S26 also known as L1 (R1b1c9a) and S29 (R1b1c9b) have been extensively tested within R1b1c and the derived individuals STR profiles also meet the requirements of >15% mismatches. Further information is available at www.geocities.com/mcewanjc/ S26 and S29 are changed from provisional to confirmed on 28 May 2006. In References: added Karlsson et al (2006) on 10 June 2006. In References: added Semino et al (2000) and Wells et al (2001) on 10 June 2006. In Additional Resources: removed Doug MacDonald, R1a Analysis (link no longer active) on 10 June 2006. In Additional Resources: added Dennis Garvey, Discussion on R1a on 10 June 2006. In Additional Resources: added Dennis Garvey, Discussion on R1b on 10 June 2006. In Additional Resources: added National Geographic Genographic R1a page on 10 June 2006. In Additional Resources: added Charles Kerchner, R1b and Subclades YDNA Haplogroup Project on 6 July 2006. Added Regueiro et al (2006) on 6 July 2006. Added Note on P25 and Adams et al (2006) on 13 July 2006. Name amended on David Wilson reference in Additional Resources on 9 October 2006. Edited note on Karlsson et al (2006) on 9 October 2006. Corrected spelling of Transcontinental on Regueiro et al (2006); added page numbers on 9 October 2006. Added Kayser et al (2003) on 9 October 2006. Added McKee, Rutledge, Scott and Silver in Additional Resources on 16 October 2006. Changed M18, M37, M65, M160, P66 to private; added Private SNPS S50, S69, and S44 on 5 December 2006. Added Sims et al (2007) and SNPs U106, U152 and U198; removed Ken Nordtvedt's Modals of R from Additional Resources on 17 December 2006. Added in Additional Resources, Ron Scott- R1a and updated link for R1b-R2 on 20 December 2006. 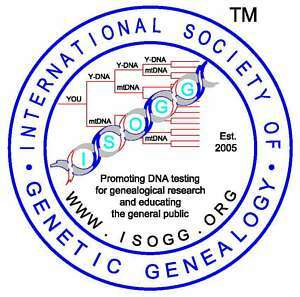 Copyright 2006, International Society of Genetic Genealogy. All Rights Reserved.